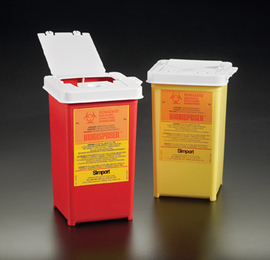 These containers ensure safe and convenient disposal of blood collecting equipment, such as: hypodermic and IV needles, etc. Will safely sheathe or unwind needles after use. Slot securely grips the needle hub, and a simple twist releases the needle from the holder, allowing it to fall into the container. This 1-liter container holds approximately 500 blood needles. Its flexible port design accommodates other disposal needs as well. This polypropylene container and cover can be flash autoclaved without melting. Available in two colors: red and yellow.